The Experience Hendrix 2010 tour is set to kick-off in March with an all-star lineup including Joe Satriani, Jonny Lang, Eric Johnson, Kenny Wayne Shepherd, Brad Whitford, Doyle Bramhall II, Ernie Isley, Living Colour, Double Trouble's Chris Layton, Billy Cox, Sacred Steel featuring Robert Randolph, Susan Tedeschi and David Hidalgo and Cesar Rosas of Los Lobos. 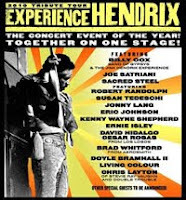 Check out http://www.experiencehendrixtour.com/schedule for more details and artist performance roster. I wonder how long each artists set will be? Could this come to the UK? Good question. It would all depend on a promoter in the UK bold enough to take on such an undertaking. This could get expensive! Maybe a thinned-down roster of players would be feasible commercially -- get just the top-draw acts to do a few shows under the festival's banner.